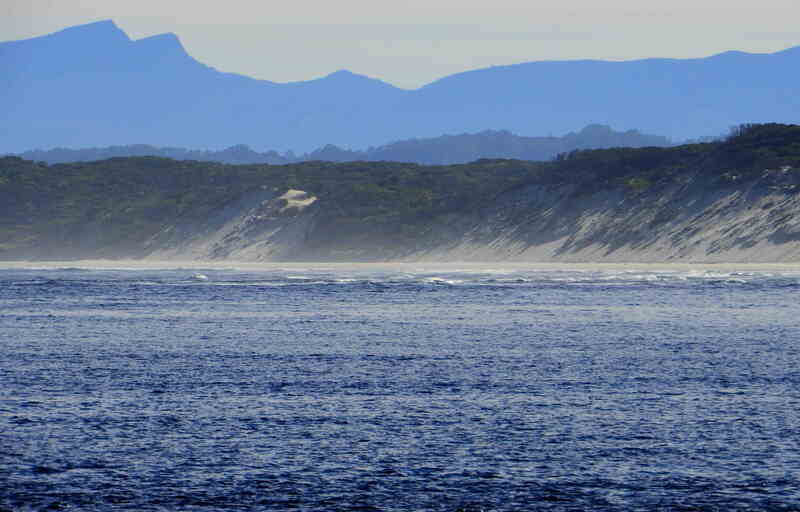 This post continues on from: Hobart to Strahan – The In-Between Bit. Strahan has, on average, 15 clear days a year. 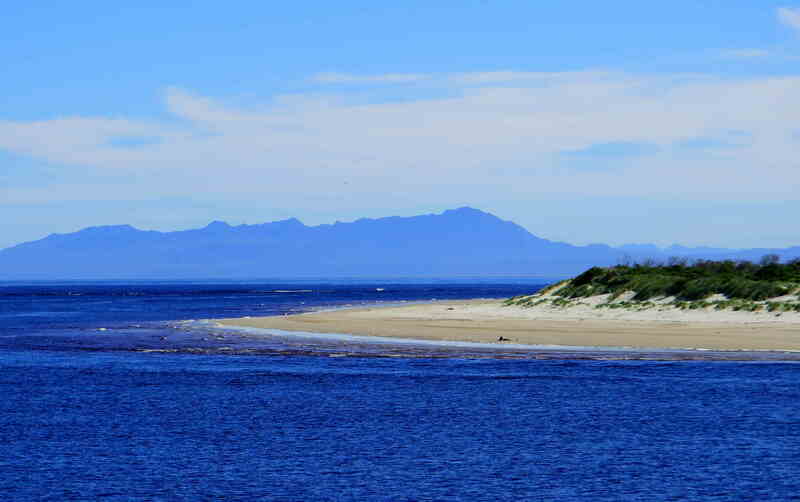 On our visit we had three of those – just fabulous weather, as the photos attest. 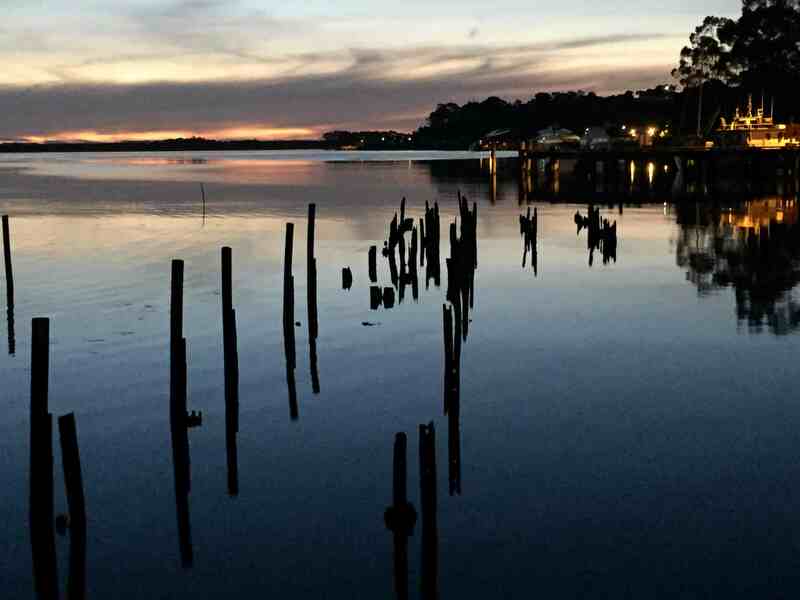 It was our first visit to Strahan in over fifteen years, and while much was the same, there was much that was different. In particular, we were taken by the sophistication and laid back professionalism of our three days and nights there. We found great coffee and restaurants serving quality food based on local ingredients. And we found one intriguing recipe – see the end of this blog post. 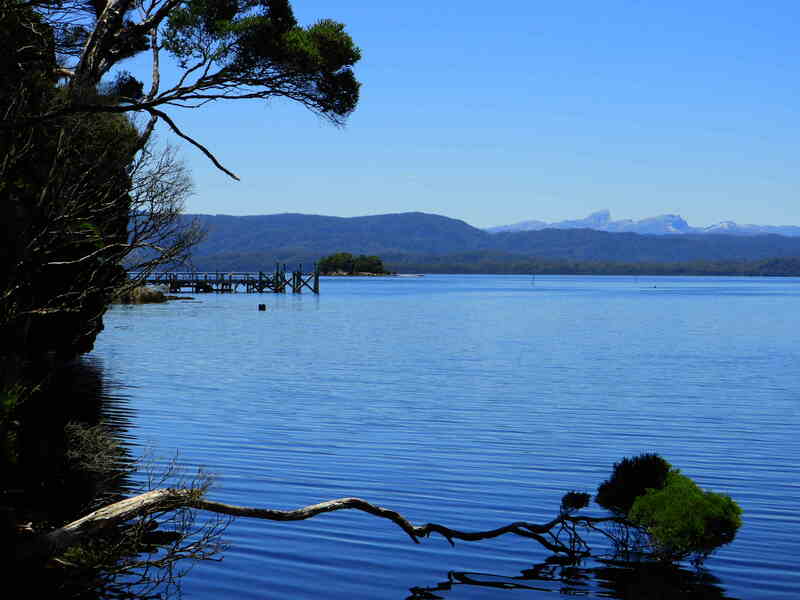 The township of Strahan and its working port are located at the northern end of the vast Macquarie Harbour. 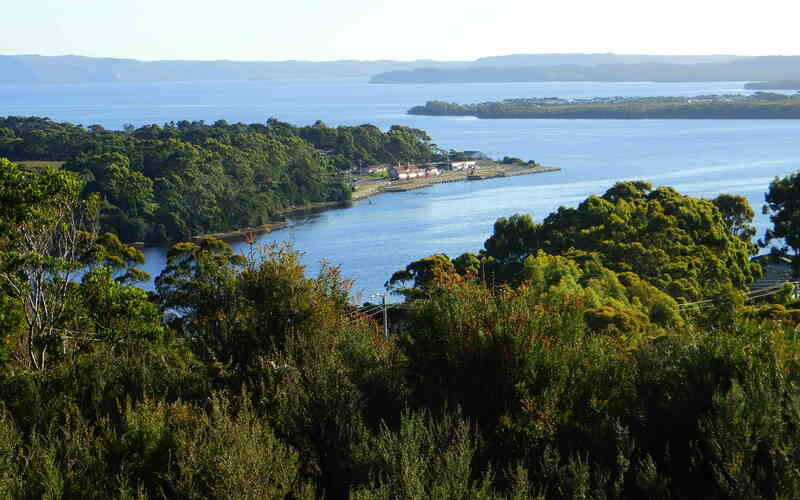 In this photo the main port area is in the bottom right of the picture, hidden by the trees. 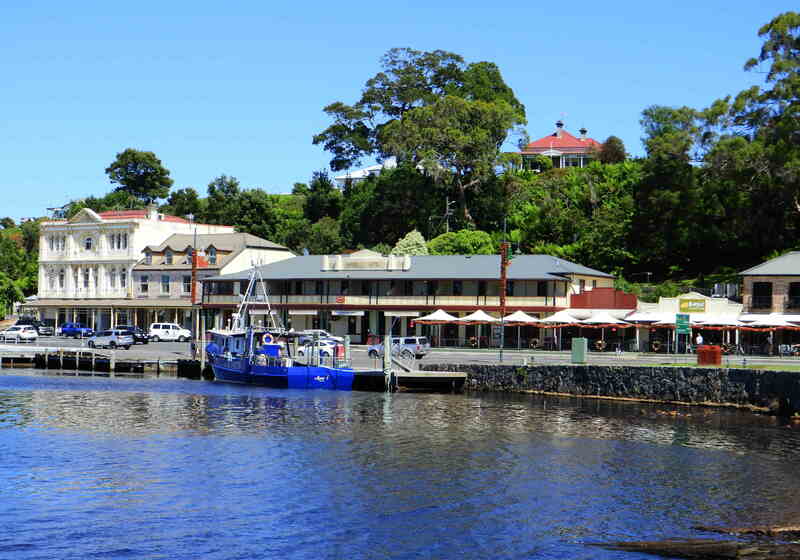 At first sight, for most visitors, the town just consists of the Gordon River cruise departure depots and the shops and cottages nearby. However, there are other shops, accommodation places and attractions tucked away and within easy walking or driving distance. In particular, the Esplanade forms a 2.5 km U-shape around the waterfront. Risby Cove is the small bay in the middle of the U, with accommodation and a restaurant. Catch it on the right day and you will have some glorious views. 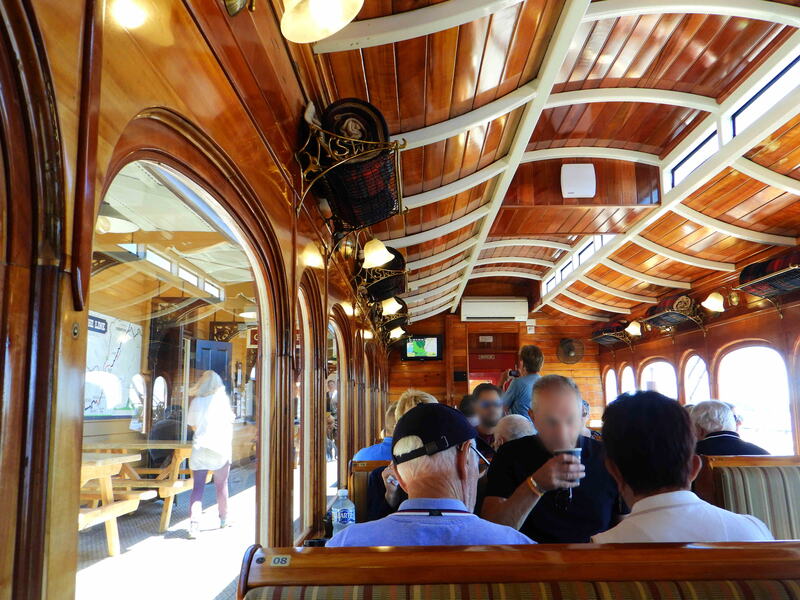 The restaurant is worth a visit because of the interior which gives the feel of sitting inside a glass house. 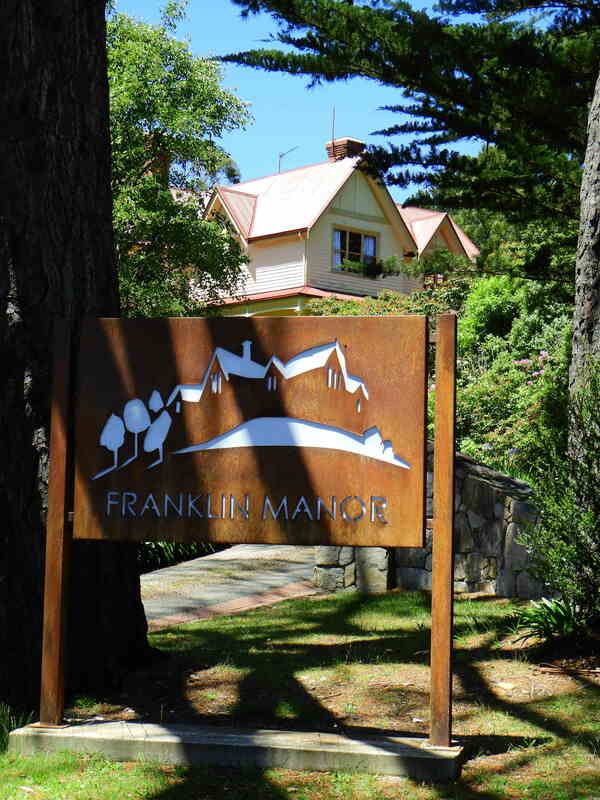 Nearby is Franklin Manor, where we stayed. This large period house has a great deal of sophisticated character with its many rooms and lounges. 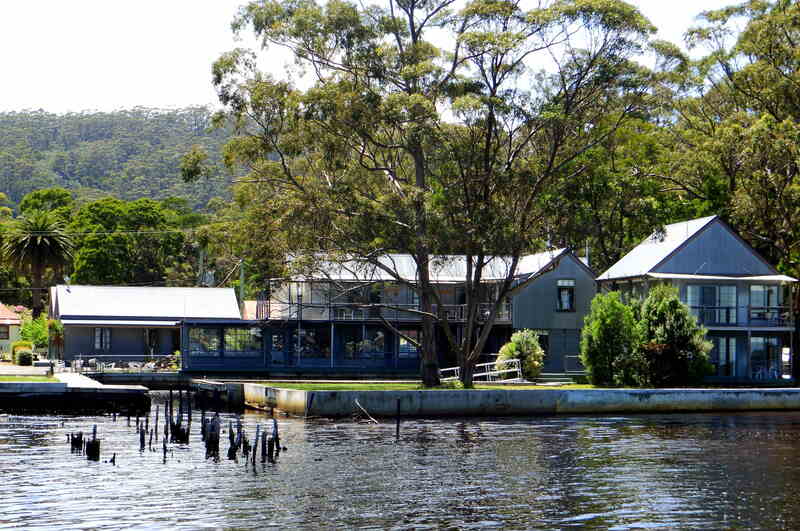 It once housed one of Tasmania’s most acclaimed restaurants. The commercial kitchen still functions, albeit for breakfasts only, but one day it again might serve guests in search of fine dining. At the other end of the U, opposite the main Strahan complex is the Tavern. It serves typical, good quality counter meals and provides a chance to mix with the locals. 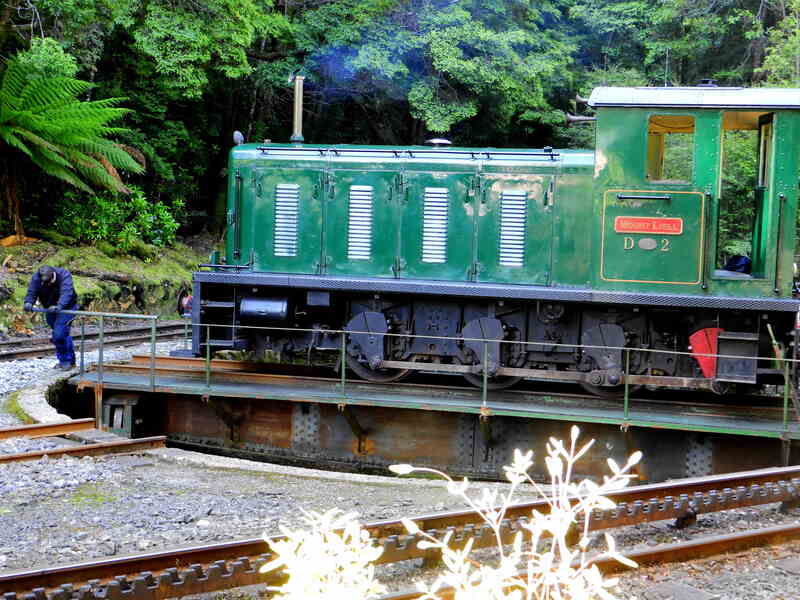 Nearby is the departure point for the Wilderness Railway which takes you along the side of Macquarie Harbour before heading inland towards Queenstown, through some gorgeous rain forest. We did a half-day tour, with the engine being turned around for the return journey. 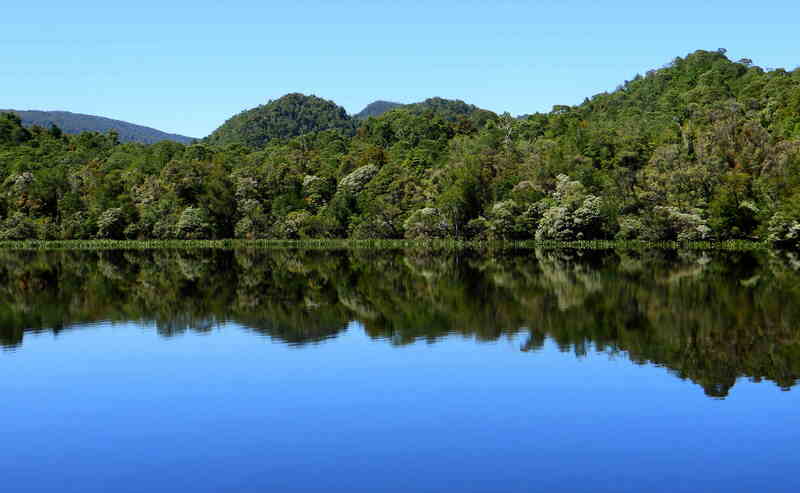 The other great excursion, of course, is the Gordon River cruise. 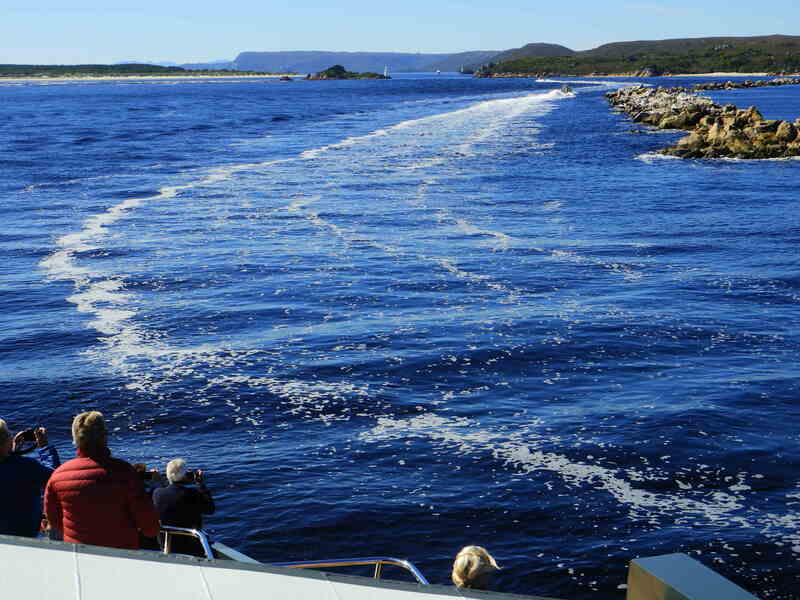 Our boat took us first to the entrance of Macquarie Harbour. A police boat had asked the captain to provide a backup for a rescue for an overturned runabout at sea. So we kept going through the heads for a couple of kilometres, seeing sights that tourists rarely see. 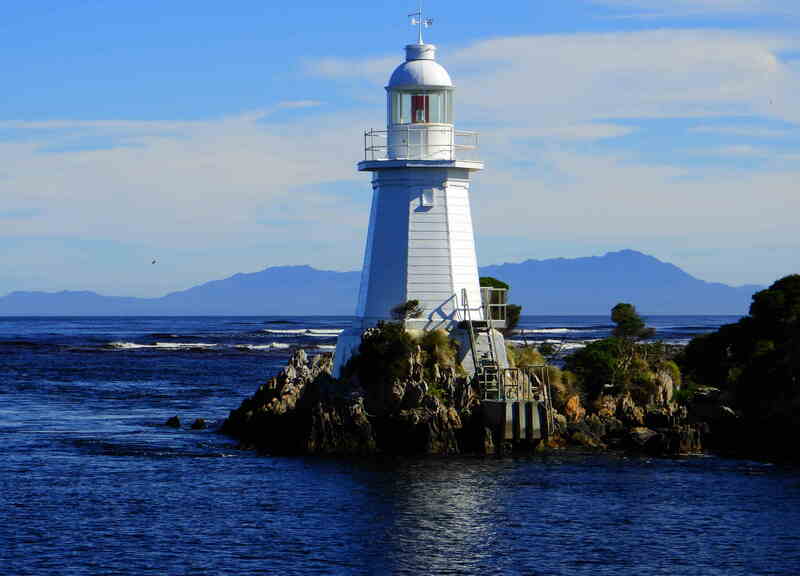 Back in the harbour, we headed south for the Gordon River. 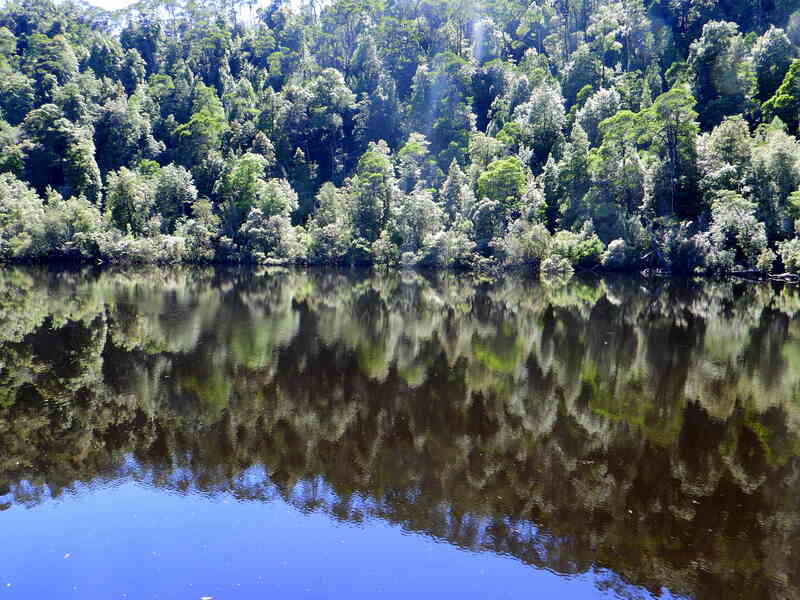 The Gordon River is known for its brilliant reflections of the extraordinary rain forest along its banks. 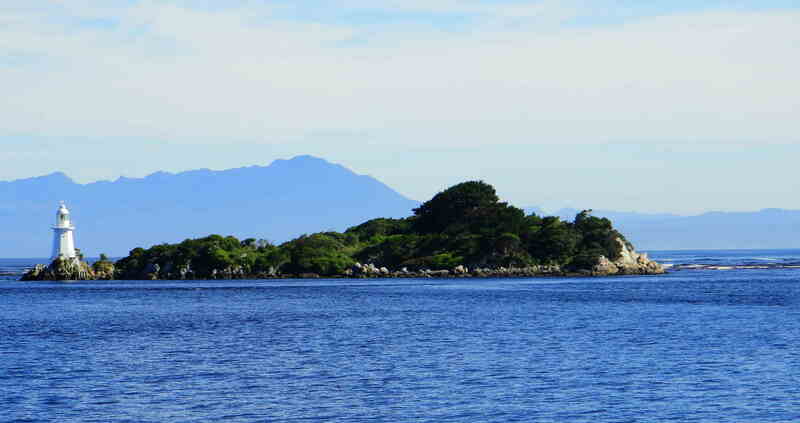 We later headed to Sarah Island, a former convict site. But on our day it was an amazingly peaceful place; far from a place of persecution. 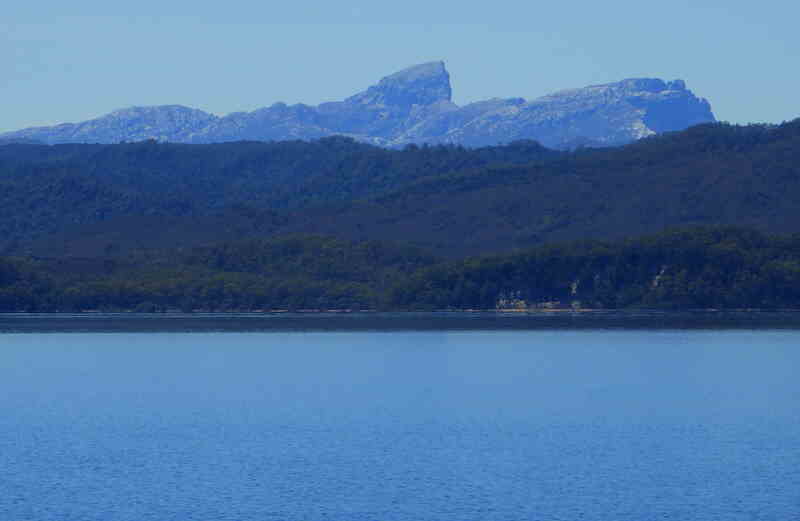 The trip back up the harbour to Strahan gave glimpses of the distant mountains that early European explorers would have seen and named. 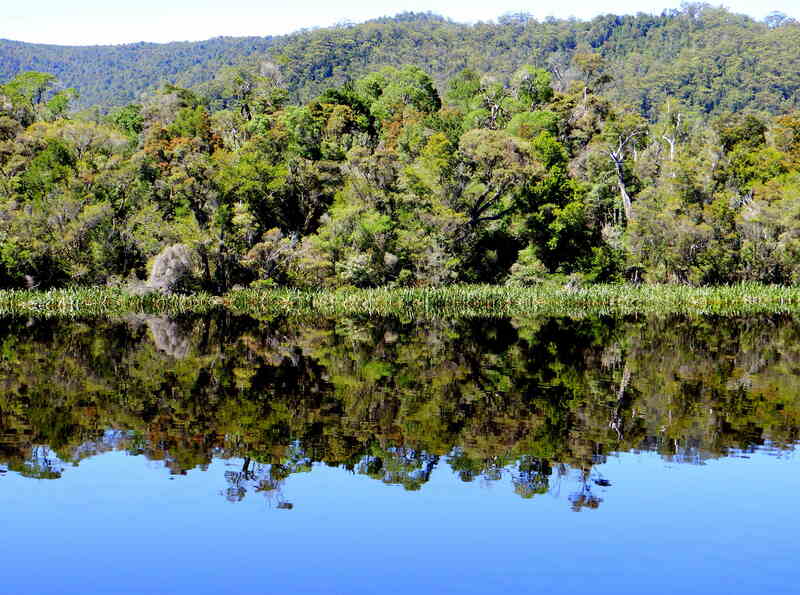 The guides on Sarah Island also act each night in a play back in Strahan. “The Ship That Never Was” is Australia’s longest running play. 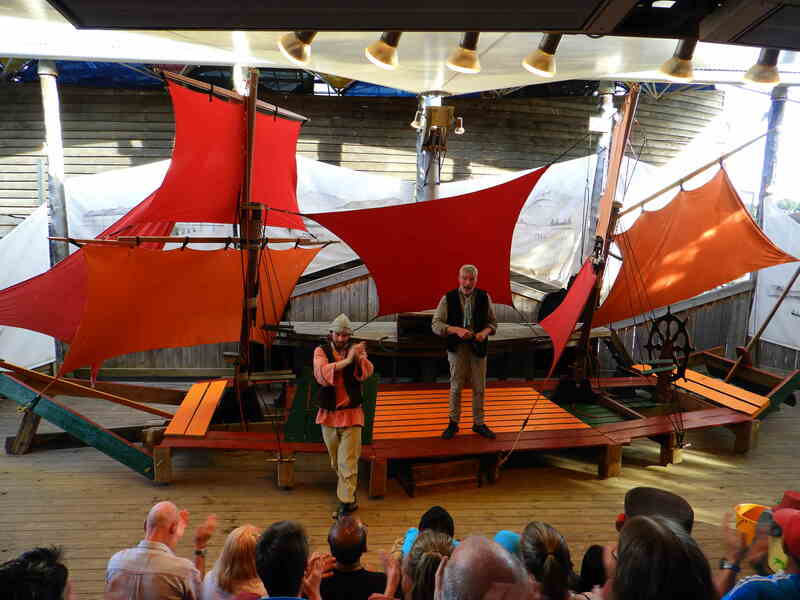 It lasts 75 minutes and is riotously funny as it tells the story of a ship and the sailors thereon, while actually reconstructing a ‘likeness’ of the vessel as the play progresses. Just opposite the outdoor (but covered) amphitheatre where the play is held is The Coffee Shack, housed in a small pre-fabricated building but serving high quality coffee and excellent homemade cakes. 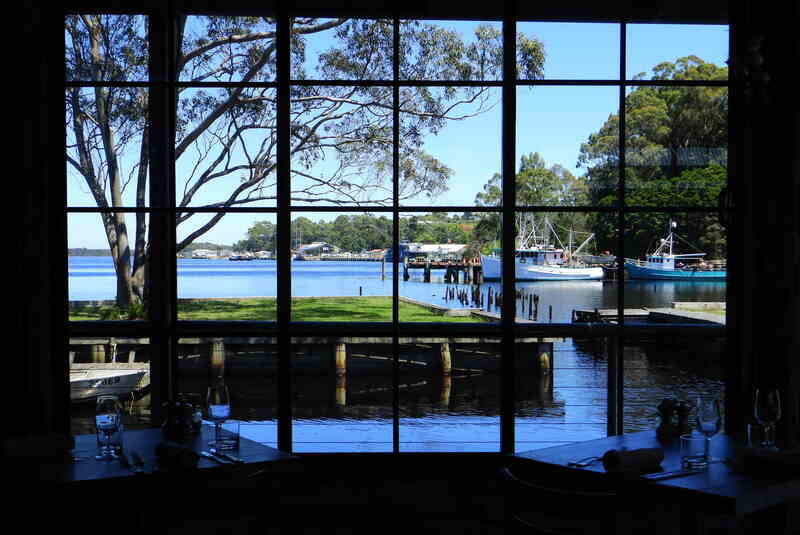 Nearby is the Bushman’s Cafe, the restaurant most often recommended to us by the locals. 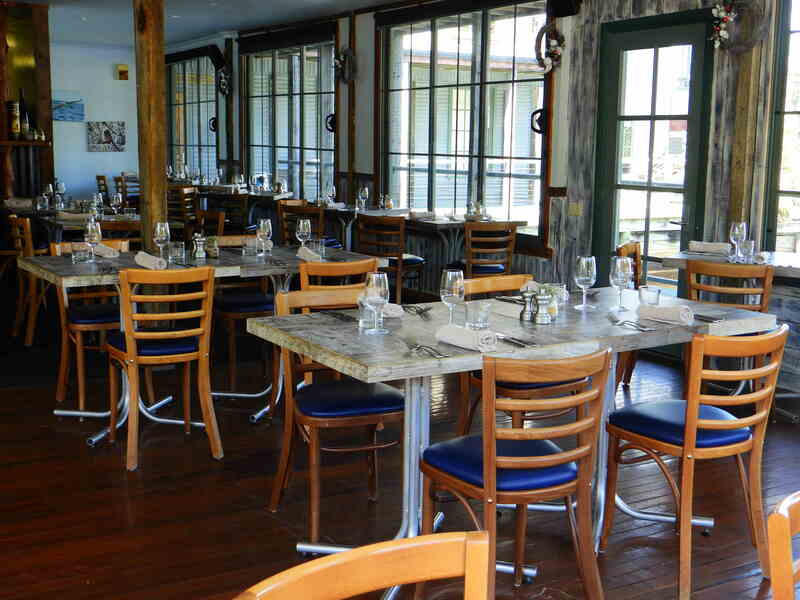 It is more than a cafe, serving interesting Tasmanian produce based dishes at night time. The great news is that on the 14th January, 2019, the creative owners of Bushman’s opened a second restaurant about a kilometre away in Ormiston House, a fine dining option called Frederick’s. On our night at Bushman’s we had an intriguing dish of slices of salmon served on a hot plate. Our notes read “it seems the serving plate was heated to very hot in the oven; the raw salmon was then placed on top, with the residual heat enough to cook it through; it was served on the hot plate with a beurre blanc sauce ladled over; some garnishes added”. 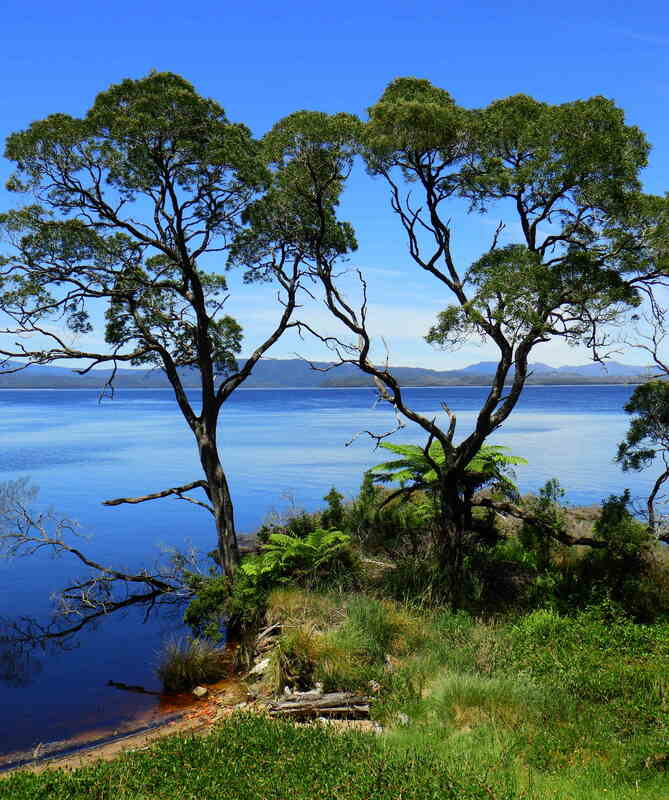 We have since spoken with Bushman’s and they have provided us with more detail. A major problem is what plate to use. Bushman’s uses an oven-proof ceramic plate. The alternative we give is to try a steak sizzler. If you want to give it a go, use the following notes. Be careful because the plate will be very hot. The end result is salmon that is mostly well-cooked, however, the result is still most enjoyable. The steak sizzler option might be the better option as it requires less room. Thus, if you only have a small oven, you may find it difficult to heat up more than a couple of plates. Preparation: You need to be well-prepared as the moment the hot plate is ready, you must finish the preparation immediately as the salmon will cook quickly. Thus have your salmon sliced, have the olive oil ready, have your desired sauce prepared, and have any garnishes ready to add. Ceramic plate: Take care as the plate gets very hot. Use a plate that is oven proof and can stand high heat. Heat it to 220oC in the oven. When you remove it, do not put the hot plate onto a cold surface as it might crack and do not pour cold oil on the hot plate, but heat it first, again to avoid cracking. Steak sizzler: You often see these cast iron devices in Asian restaurants. Heat the sizzler in the oven or on a hot plate until very hot. You could add cold oil to the sizzler but reheat it. Salmon: Buy a side of Atlantic salmon, or enough to meet your needs. Allow around 200 g per person. As you need to thinly slice the salmon, you may need to buy a little extra. Remove the skin. Using a very sharp knife, slice the salmon almost as thin as smoked salmon slices and similar shape. Fan out each serve. Perhaps have a large spatula ready to help place the salmon on the hot plate. Sauce: Use what you think will work well. There are numerous options. Bushman’s served the salmon with a creamy beurre blanc. You could try a mustard and dill cream sauce. You could try an Asian style sauce such as homemade teriyaki. You could try an Italian-style pesto; you could try chimichurri. (See: green sauces.) You could try a vinaigrette. Garnishes: Use whatever is appropriate. Bushman’s serves their salmon with roasted cherry tomatoes. 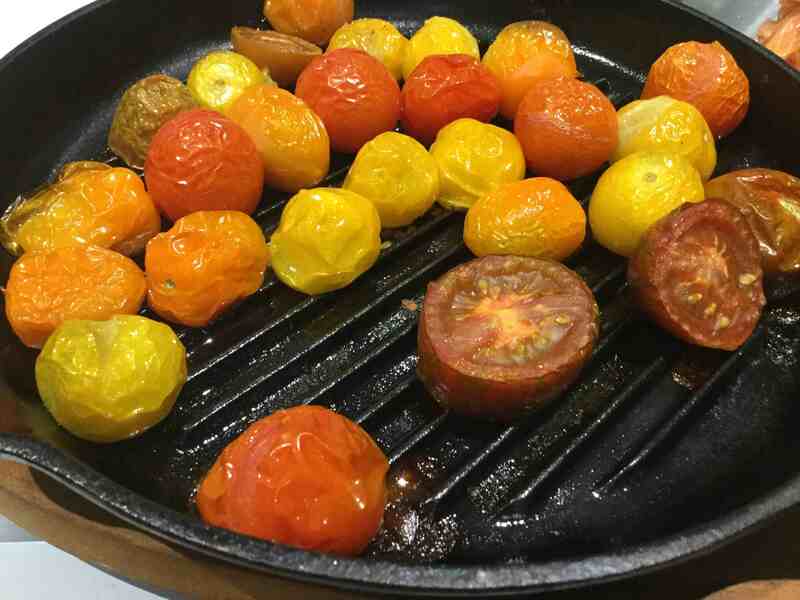 These could be roasted in the oven while the plates are heating or pan fried. Coat or spray with some olive oil first, and half way through the cooking time prick each tomato with the point of a knife. Plating and cooking the salmon: Once the hot plate is ready, add enough hot olive oil to provide a film. Use a spatula to lift the salmon onto the plate and to fan it or spread it around, giving a thickness of amount 1 cm. The salmon will immediately start to cook through from the bottom. Finishing off and serving: Some of the top of the fish will not be totally cooked. Eat it as is or you could put the platters back in the oven for a minute or two or you can turn the uncooked parts over onto the hot plate. Pour your sauce (hot or cold) over the salmon, add garnishes. Serve immediately. Degree of difficulty: 4/5 (reasonably difficult). 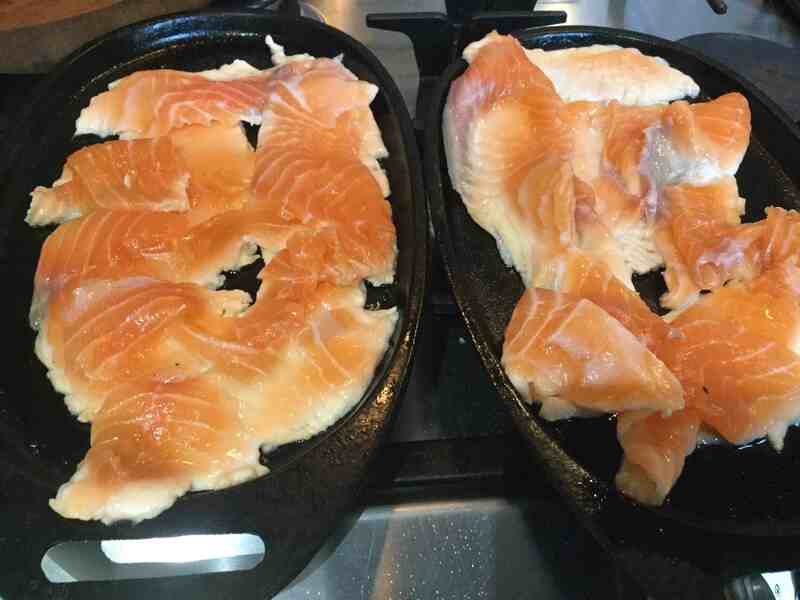 You need to be careful with the hot plate (warn our guests) and take care not to overcook the salmon. Our next blog post is about our five days at Olive’s Cottage.